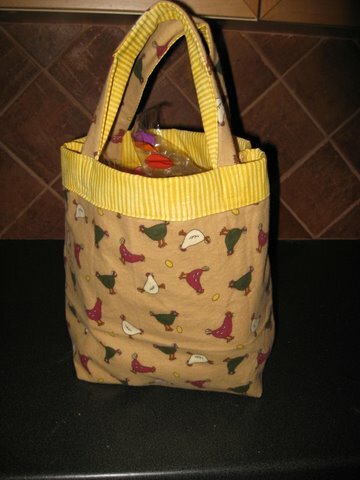 Lunch tote bags — more to come! I made a new lunch bag to use for work. 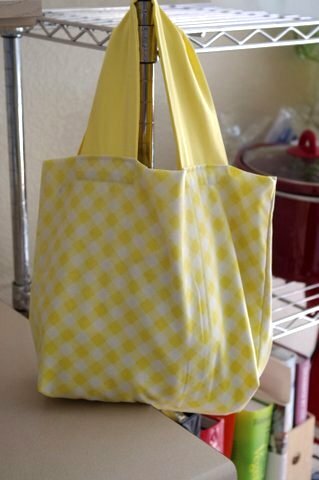 I’m currently rotating three little tote bags that I got at Target maybe two months ago for a quarter each, and I’d like to have more so that I can have some in rotation even while others are in the laundry pile. I have yet to wash them and I’m grossed out by myself, they’re sticky from maple syrup and have a certain aroma by evening. 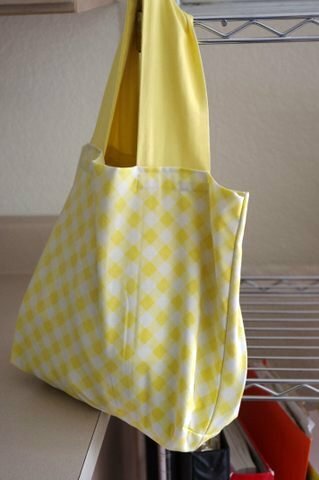 Yesterday I brought a cloth napkin in my lunch bag and I realized that I could make an entire collection of lunch totes in addition to reusable napkins. 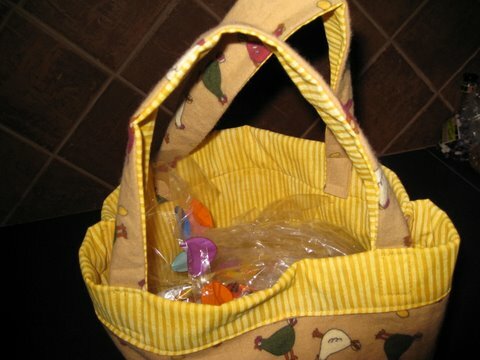 They don’t need to be especially sturdy or secured with velcro or insulated or anything, simply small tote bags to corral my food, which is usually in plastic Gladware containers, until lunchtime. 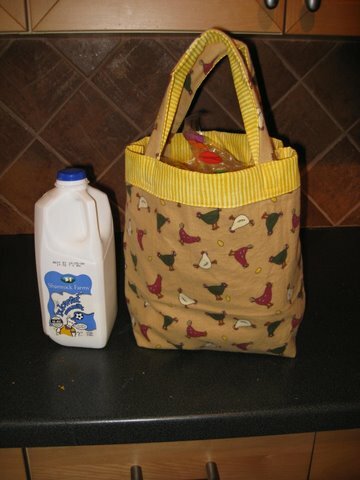 Until I bought the current tote bags I was using a plastic grocery bag, which caused problems when I would forget which fridge I used and had to go searching among all the other plastic grocery bags to find my food. (“Why am I pawing through your lunch, you ask? 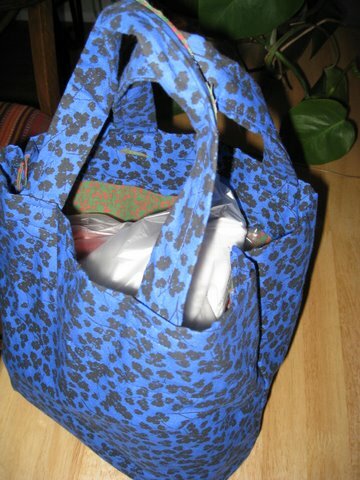 Um, because I thought maybe it was mine…?”) A distinctive cloth bag helps me locate my lunch even when I’m not able to put it in “my” spot: middle fridge, bottom right at the back. The simple tote bag tonight took me an hour, I’m sheepish to admit, although the next one should take half that now that I’ve figured out a design. 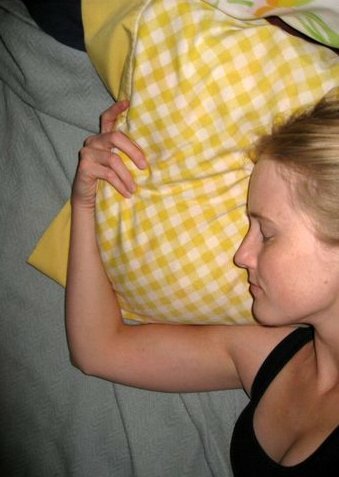 I was going to find a tutorial like this one and then realized, “How hard can it be? And if I start looking for tutorials I’ll never get it done, I’ll spend three hours reading blogs and viewing step-by-steps instead and then call it a night. I’ll figure something out, and if it doesn’t work, I’ll do it different or use a tutorial next time.” And there will be a next time — I want half of dozen of these! Unfortunately, the camera ran out of batteries after I took a picture and before I uploaded it to the laptop, so I’ll have to add a photo after I locate the charger. September 28, 2009. 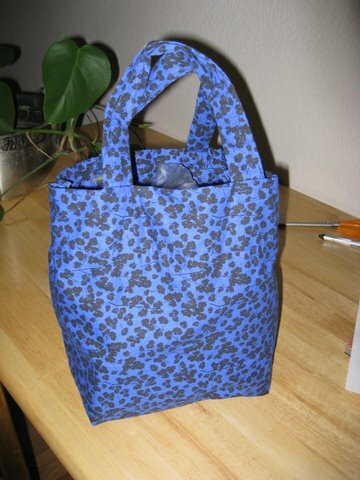 Tags: bag, completed project, tote bag. Pictures, Projects, Recipes, Words. 3 comments.